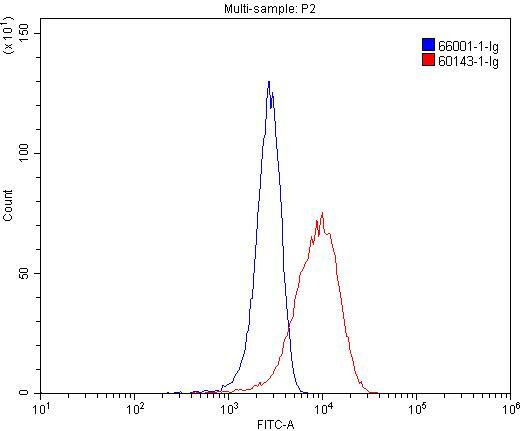 IP Result of anti-CD206 (IP:60143-1-Ig, 5ug; Detection:60143-1-Ig 1:300) with human placenta tissue lysate 1520ug. 1X10^6 RAW 264.7 cells were stained with 0.2ug CD206 antibody (60143-1-Ig, red) and control antibody (blue). Fixed with 4% PFA blocked with 3% BSA (30 min). Alexa Fluor 488-conjugated AffiniPure Goat Anti-Mouse IgG(H+L) with dilution 1:1500. CD206, also named as MMR, CLEC13D and MRC1, is a type I membrane receptor that mediates the endocytosis of glycoproteins by macrophages. CD206 has been shown to bind high-mannose structures on the surface of potentially pathogenic viruses, bacteria, and fungi so that they can be neutralized by phagocytic engulfment. CD206 is a 170 kDa transmembrane protein which contains 5 domains: an amino-terminal cysteine-rich region, a fibronectin type II repeat, a series of eight tandem lectin-like carbohydrate recognition domains (responsible for the recognition of mannose and fucose), a transmembrane domain, and an intracellular carboxy-terminal tail. It is expressed on most tissue macrophages, in vitro derived dendritic cells, lymphatic and sinusoidal endothelia. 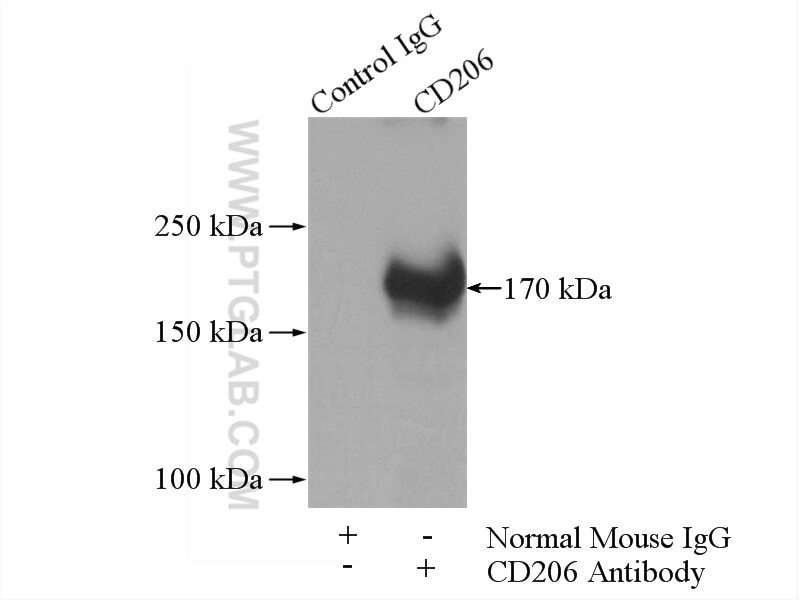 This antibody recognizes the intracellular carboxy-terminal part of CD206 and MRC1L1. Involvement of JNK signaling in IL4-induced M2 macrophage polarization. The observed difference of RAW264.7 macrophage phenotype on mineralized collagen and hydroxyapatite. Mannose-modified chitosan microspheres enhance OprF-OprI-mediated protection of mice against Pseudomonas aeruginosa infection via induction of mucosal immunity.